Projects Abroad offers a wide variety of projects for corporate groups to get involved in the developing world. Our aim is to take the pressure off your organisation by arranging safe, rewarding and enjoyable trips for anything from five to one hundred employees. Projects Abroad has been specialising in arranging volunteer placements in the developing world since it was founded in 1992. Over the last few decades, we have sent over 100,000 volunteers from around the world to hundreds of different projects across 30 destinations and volunteering as part of a group has grown dramatically during that time. A corporate volunteering group trip provides great benefits to a community in a developing country while generating business value in the form of increased employee engagement and opportunities for team-building. Community involvement is a crucial part of corporate citizenship. Employee volunteers are perhaps the greatest asset companies can influence when trying to have a positive impact in the communities worldwide. It is the employees themselves who strengthen corporate citizenship from the inside out with compassion, innovative ideas and unparalleled energy. We can organise a bespoke volunteer group trip for your company. Your group could join a building, medical, conservation, care or teaching based project. It can be for as short as 1 week to as long as 3 months, it is entirely up to you! Companies benefit through motivated employees, and improved brand and reputation. Employees benefit though new skills development, an improved ability to work with people from different cultures, and better communications skills. Local communities benefit from the new skills they learned and the services that have been provided by the corporate volunteers. The new phase of CSR has kicked-in and has evolved drastically over the last 30 years. Companies around the world are now taking greater responsibility for their effects on environmental and social well-being. International corporate volunteering is an integral component of CSR. The implementation of employee engagement through volunteering goes a step beyond sending donations to environmental and humanitarian projects and charities. Some companies have begun sending groups of employees to help volunteer around the world every year, whether it's through a lottery, a sign-up and selection process, or as a reward for it's highest working and achieving staff members. The results of this repeated process year on year results in better company engagement, increased levels of pride and satisfaction within the company and it's staff members, and an overall sense of achievement that others strive to work towards. 89% of respondents felt that companies that offer volunteering opportunities have a better working environment than those who don’t. 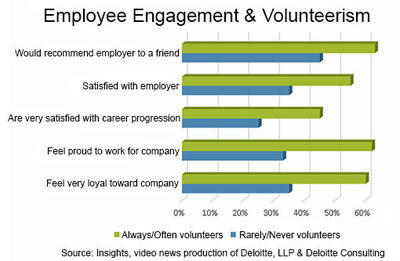 70% of respondents said that volunteering boosts employee morale more than other activities. 74% of respondents felt that volunteering enhances their sense of purpose. "We were very happy with the result of our building work on the trip. We really enjoyed interacting with the kids, getting a section of the site fully completed, and exploring what Kathmandu had to offer. Everyone in the team made a significant contribution on the project and arrived home with memorable experiences to ponder and share. 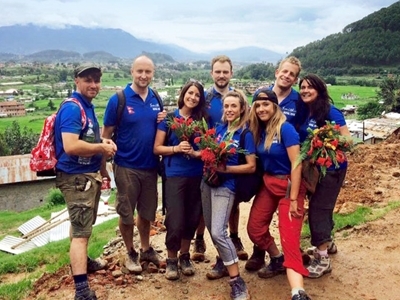 If you want to read an example of a previous corporate group, please see the Pearson Foundation's case study, or either of the SmithCorp Charitable Trust's trips to Nepal or Costa Rica. Not interested in a group trip but would like to send employees on individual volunteer projects, please see here. If you want more information on the types of projects that your corporate group can get involved with, please see here.